There is no more personal gift than a Sorella ring marked with the date of a very special occasion - an engagement, wedding, birth, adoption or any time worth remembering. 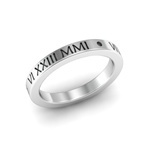 Elegant Roman numerals will give your ring a classic beauty that never goes out of style. We can present your special date in any format you'd prefer, While the traditional presentation in the United States is "month, day, year," we can also present your date in formats popular internationally, such as "day, month, year" or "year, month, day." Abbreviated dates such as "month, year," or "month, day" can also be accommodated. Additionally we can simply present any number or numbers you'd like. Just let us know your preference and we'll convert your special date or number into elegant Roman Numerals. 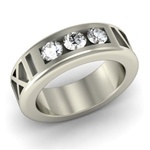 A wonderful choice for an anniversary ring or wedding ring.